And what's that behind Claire's baby sock? 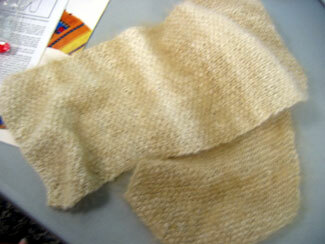 It's Julia's just finished "Sophia the bunny" angora scarf! Love that variegation. That's one pretty bunny! 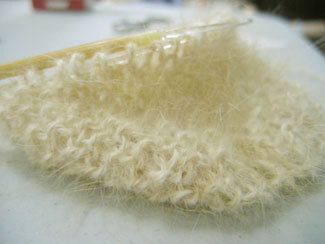 Julia is starting a seed stitch scarf in some amazingly soft angora she got at Rhinebeck last year. The yarn label even listed the name of the bunny on it: Sophia! 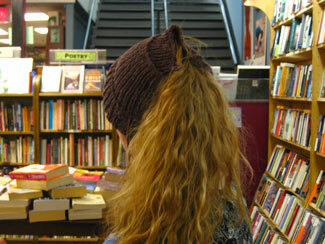 Julia finished her Birdwatcher's Hat! And before she tied the cord through the top to cinch it up, she discovered that she could wear the hat with the top open as a ponytail hat. 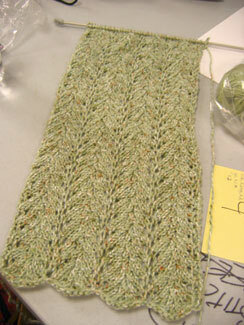 Julia's venetian scarf is looking awesome! 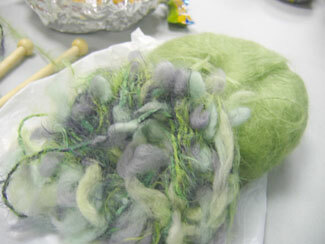 Julia's friend brought her this fabulous mohair and this beautiful tufty yarn back from Venice. Julia's starting a fun scarf with them! Julia spent almost all of September working on this feather and fan scarf, knit in yarn she got at a recent Knitsmiths's swap. Julia's been working on baby things. 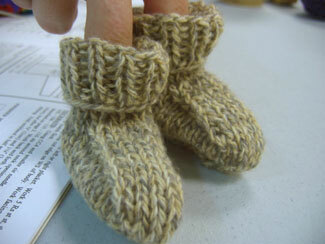 She knit these super cute booties with Blithe yarn (that's made from baby camel hair, you know) and they are sooooo soft. Julia has pulled out another long-neglected work-in-progress to finish up. Yes, it's the cockroach, um, ladybug sweater that she inspired me with. 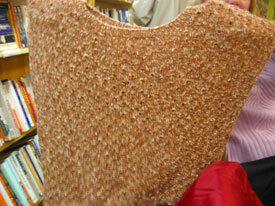 She's got this last sleeve to go and then JUST the steeking. Ha! Julia has had this cap-sleeve sweater for her sister on the needles for years and has finally gone back to finish it up. It's all coming together now! 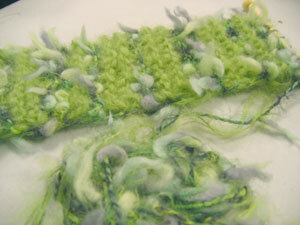 Look at the pretty lacy bits. 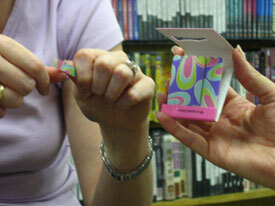 A couple of weeks ago, Julia excitedly announced that she'd found the cutest little matchbox of emery boards to bring with her to knitting to stop those annoying little snags you get when a nail is just a little uneven. We've all had this problem, right? Sadly, no one needed it that day. Finally, this week, she and the emery boards had their big moment, when Shannon casually asked, "does anyone have a nail file?" 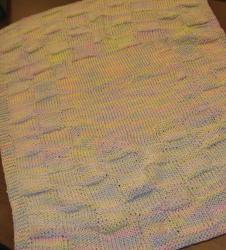 Julila's finished another baby blankie! After finishing a similar blankie last year in the same Berroco Cotton Twist yarn, she started this cabled lap blanket version for another baby. 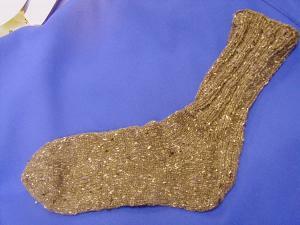 Julia has finally finished her first pair of socks! These socks have been so long in the making that she's actually finished other socks in the meantime. Congrats to Julia for going back and getting these done! 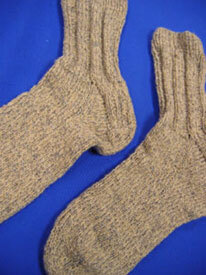 They are knitted in Rowan Felted Tweed and will be for her father. 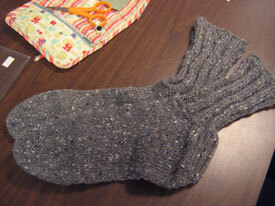 Julia finally finished her first socks! That second sock waited a year at least. 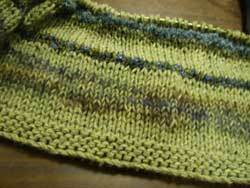 The yarn is Blithe from Classic Elite and it's heavenly soft. Someone's feet are going to be very happy. 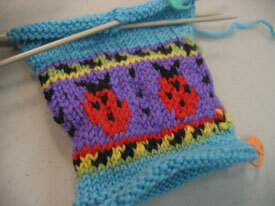 Julia's working on an ambitious afghan project. 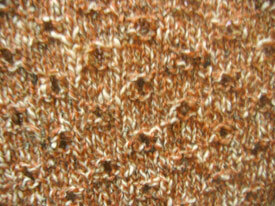 It's a sort of Colinette inspired afghan with many different yarns in different fibers and colors. It's gorgeous so far! She's on a roll! Two finished projects in a row. 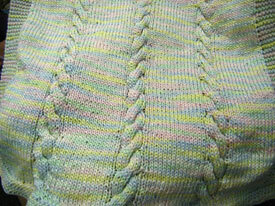 This one is a baby blanket knit with Berroco's Cotton Twist yarn. Very sweet. 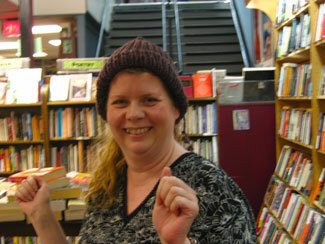 A little break from knitting and Julia is back! 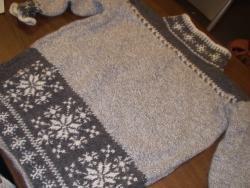 She's just completed this beautiful sweater that she's been working off and on on for about seven years. Way to go!